To what extent has populism become a feature of public debates in European countries? Matthijs Rooduijn employs content analysis to assess the frequency of populist statements in newspaper articles in France, Germany, Italy, the Netherlands and the UK. He concludes that populism is more widespread in these countries than previously assumed, with populist parties not only enjoying more electoral success, but populist messages also becoming more pervasive in public discourse. Radical right-wing parties have become increasingly successful in Western Europe; UKIP in the UK, the Front National in France and the Freedom Party in the Netherlands fare very well in opinion polls. Similarly, radical left-wing parties like Podemos in Spain and Syriza in Greece are increasingly popular among voters, underlined by Syriza’s victory in the Greek elections on 25 January. Although these parties differ from each other in many respects, they also have something in common: they all express a populist message. While a lot has already been written about populist parties, relatively little is known about the extent to which this populist message has become widespread beyond the party political sphere. To what extent has the populist message affected public debates in Western Europe? And do these debates become more populist when populist parties are successful? In a recent study I examine these questions. Although scholars still quarrel about the question of how to define populism, they increasingly agree that populism can best be defined as a political message concerning the antagonistic relationship between the (good) people and the (evil) elite. The Dutch political scientist Cas Mudde, for instance, argues that populism is “an ideology that considers society to be ultimately separated into two homogeneous and antagonistic groups, ‘the pure people’ versus ‘the corrupt elite’, and which argues that politics should be an expression of the volonté générale (general will) of the people”. The central elements of the populist message are ‘people-centrism’ and ‘anti-elitism’. Populism is people-centrist because it emphasises the idea of popular sovereignty and argues that the popular will should be the point of departure for every political decision. Populism is anti-elitist because the elite (be it a political, economic or cultural elite) is criticised for having lost touch with the people. The elite is accused of being corrupt, incompetent, arrogant and/or selfish. To what extent have public debates in Western Europe become increasingly populist over the years? To answer that question I have assessed how populist opinion articles in newspapers are (I focused on editorials, columns, op-ed pieces and letters to the editor). I collected 15 newspapers in 5 Western European countries (France, Germany, Italy, the Netherlands and the UK). In every country I selected four ‘election periods’ (the four weeks before a general election) between 1988 and 2008. I drew a systematic sample of days from every election period and selected those opinion articles that concerned domestic and EU politics. Although the opinion section in newspapers is not the only media site where the public debate takes shape – there are, for instance, also magazines, television programmes and discussion forums on the internet – it is still one of the most central ones. 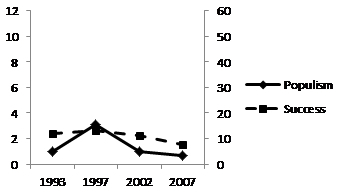 Figure 1 displays the average populism scores per newspaper. 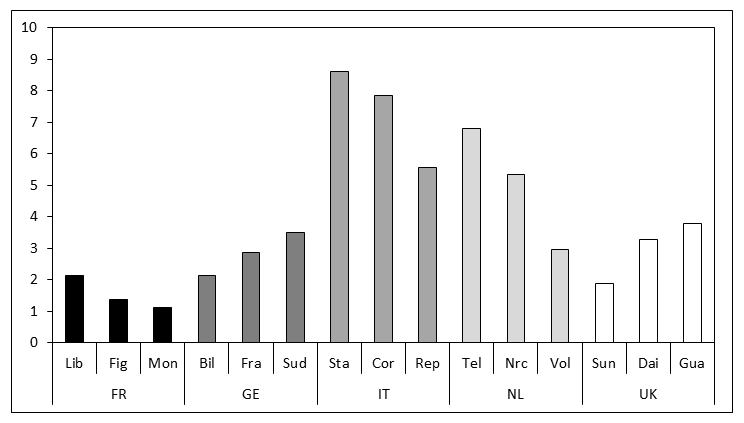 The debate in Italy turns out to be more populist than in other countries. This might well be due to the widespread corruption scandals in the country. 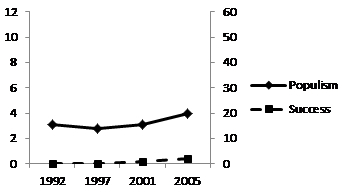 The high score in the Netherlands is to a large extent due to a peak in 2002. This peak can most probably be explained by the impact of the sudden political upsurge around the murder of the populist politician Pim Fortuyn. The debate in France is much less populist than one might expect when one takes into account the success of former Front National leader Jean-Marie Le Pen during the first round of the presidential elections in 2002. The low degree of populism here is most probably due to the isolation of the FN: the FN was widely conceived of as radical, and many of its standpoints have long been ignored in the media. 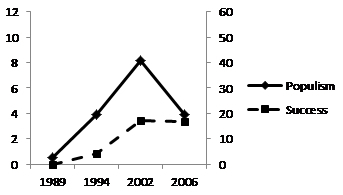 The solid lines in Figure 2 display the populism scores over time. These lines show a pretty clear net picture: in Germany, Italy, the Netherlands and the UK, the opinion articles have become more populist over the years, whereas in France this has not been the case. 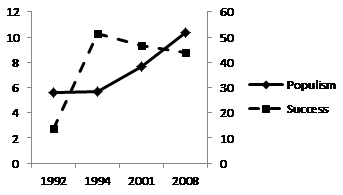 The figure also shows the predicted successes of populist parties (the dashed lines). In France, Germany, the Netherlands and the United Kingdom, the predicted vote shares for populists coincide with the degree of populism in opinion articles. When populist parties were more electorally successful in the polls, the debates became more populist as well. When these parties were less successful, the debates became less populist too. Only in Italy does the electoral success of populists and the degree of populism in opinion articles not seem to coincide. 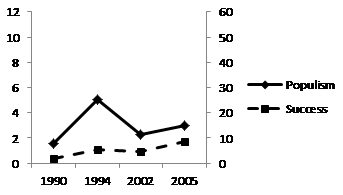 It is important to emphasise, however, that although the vote shares of Forza Italia, Lega Nord and Alleanza Nazionale (all populist parties in these years) dropped in 2001 and 2008, these parties were still very successful in this period (in fact, in both 2001 and 2008 they won the elections and also formed a government coalition together). In general, public debates in Western European countries have thus become more populist over the years. Yet the increase of populism is not steady and persistent. Populism comes with ups and downs. To a large extent, it is dependent on the electoral successes of populist parties: when populist parties are more successful, media tend to incorporate the populist message in their coverage. We can conclude that populism is more widespread than previously assumed. Not only have populist parties become more electorally successful; but the populist message itself has also become more pervasive in Western European public debates. Populism appears to be a mesmerising message that transcends the realm of party politics. Do not forget Austria. FPOe, BZOe … want the Nazi revival. In May 2006 one figure announced violent attacks, but the authorities are passive.